Bose has been one of the biggest and best names in the home audio world for more than 50 years thanks to its super high quality speakers. But more recently the company has become known for great quality at-home audio, as well as great quality audio on-the-go with its headphones. 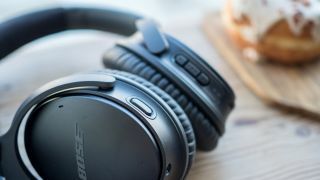 Bose headphones can be quite pricey so we've put together a list of the best Bose headphone sales and deals that are currently available. We've created this deal guide to help you bag yourself a pair of Bose headphones at the best price possible, which will hopefully be within your budget. We've searched the web for the best Bose headphones deals that are available for you right now. There are plenty to choose from, whether you like in-ear styles, over-ear styles, wired headphones or wireless headphones, you'll find lots of options below. If you can swing the price, you'll be treated to a deluxe set of headphones that delivers an unparalleled audio experience that's well worth the price of admission. They are a unique piece of technology in that they not only deliver a mind-blowing first impression, but offer it during each and every use, again and again. If you're serious about sound and want to hear your favorite movies, music and games in a new immersive way, or if you just want one of the best sets of noise-cancelling headphones you can get, the QC25 is for you. The Bose QC35 II shows why the company is so popular amongst travelers, with class-leading noise cancellation and balanced sound. They may not be the most detailed or exciting-sounding headphones, but they will sound great to most listeners. And the inclusion of Google Assistant is a nice addition. The Bose QuietComfort 20i headphones are easily some of the best sounding in-ear noise canceling headphones we've ever put through their paces. They boast amazing noise canceling technology and incredible sound, while being extremely comfortable. Additionally, we really liked "aware mode" and laud Bose for making versions compatible with every major mobile OS. For runners with NFC-enabled smartphones and music players, the SoundSport buds can be paired in the blink of an eye. For an extra $50 you can pick up the Pulse edition which features a built-in heart rate monitor. Depending on your training method, this could be a worthwhile investment as we've found their heart rate monitor to generally be fairly precise. The Bose SoundSport Free are an excellent sounding pair of wireless headphones with an ultra-reliable connection. They can easily withstand the abuses of working out, however, their poor fit and open design may turn casual listeners away. With different versions optimized for Samsung and Android operating systems or iOS devices, you can talk hands-free and control various music functions without having to reach for your phone with these in-ear headphones. Promising to deliver a deep, rich sound, they allow you to immerse yourself in your music by cutting off any interfering background noise. Built for durability, don’t expect the same plushness as some of the over-ear Bose headphones offer.